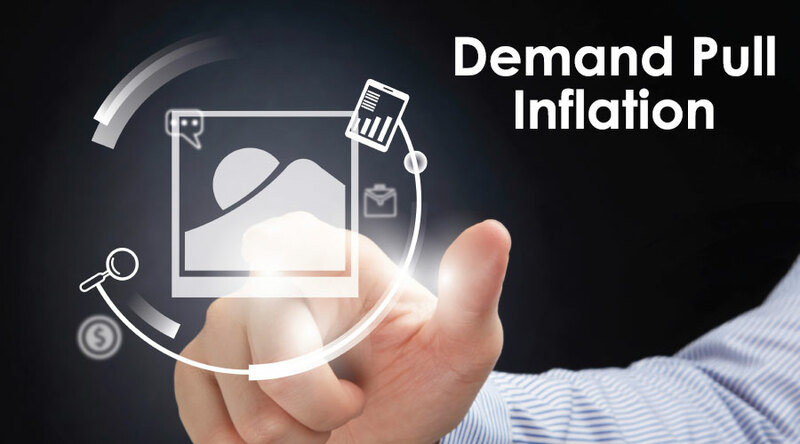 Demand pull inflation is the phenomenon when prices increase in the economy because of an increase in demand. In economic terms, it is quite popularly quoted as “too much money chasing too few goods”. It usually starts with an increased demand which forces suppliers to increase the production but since increasing supply takes some time, there arises a scenario when there are too many buyers for the same number of goods leading to misbalance in the price equilibrium. Suppliers react to such a scenario by increasing the prices and in turn shifting to a new equilibrium in the demand-supply curve. Consider a simple example of an economy which is growing at a decent rate of 3% and the inflation growth is maintained at 2%. Now the government decided to increase the growth rate to attract more investments from foreign as well as local investors. The government decides to expand its monetary policy by reducing the interest rates (repo rate) making credit cheaper for common people. Henceforth Banks are ready to give more credit at reduced rates making it easier to take home loans, auto loans or credit cards leading to increasing expenditure and eventually demand. This will lead to an increased growth rate of 5%. However, this growth rate has a price – inflation as because of the increased number of buyers the inflation will also increase to 4%. A growing economy fills everyone with optimism. Companies are hopeful that their products will find buyers, employees are optimistic that they will get good hikes, graduates are optimistic they will get good high paying jobs. Everyone feels that the economy is on track and the government is doing its best in managing it. In such a scenario people spend more, take loans, buy cars and houses. This increases demand and is one of the most common and healthy causes of demand pull inflation. This economic situation corresponds to the scenario when people expect inflation in the near future and hence buy things now to avoid buying at higher prices later. Howsoever funny it may sound; this anticipation of inflation creates a Demand Pull and in turn, leads to inflated prices. The United States faced this problem in the early 70s when firms didn’t reduce prices in anticipation of higher prices and president Nixon imposed wage hike controls which reduced spending by common people impacting economic growth. This economic situation was termed as stagflation. Government spending can also lead to Demand pull inflation. Let’s say the government plans to start some infrastructure projects like the expansion of metro lines or building new highways. Such a scenario attracts investments not only from the local businessmen but also from international investors. For local businessmen, this is an opportunity to invest in a new business or to expand their existing business. For international investors, this is an opportunity to maximize return on their investments compared to their home country. Both these factors result in more money coming to the economy which leads to high prices. For example, say the government decides to expand the highway network to a nearby area which improves its connectivity to the state capital reducing traveling time from 2 hrs. to 1 hr. This will attract investments from both foreign and local businessmen to buy land there (which will still be less than state capital) and build their offices. Better connectivity will reduce the problem of talent, transporting raw materials and finished goods. All these factors will eventually lead to an increase in the land prices in that area. A devaluation in the exchange rate of the local currency affects the economy as it leads to expensive imports and reduced prices of exports. Hence, consumers will be more inclined to buy local products and would avoid imported products thereby benefitting local industries. The improved demand will increase the prices of locally made products leading to a new equilibrium. China has been criticized to follow this policy and benefiting its home industries by intentionally undervaluing its currency. Sometimes the government feels that the economy is not growing on expected lines. In that case, the central bank will take measures to increase the money supply in the economy. With more money at their disposal, people will like to spend more which will increase demand. For example, a central bank can reduce the repo rate which decreases the rate of interest on home loans and auto loans. This will attract consumers as they are getting the same money at cheaper rates and will start buying more leading to more demand and hence increase in prices. Marketing can also create high demand for products. As explained by great marketing professors, consumers sometimes themselves are not aware of their needs. Marketing helps in bridging that gap leading to increased demand. A great example would be Apple and Xiomi firms where the demand for their products increased because of innovative marketing techniques. In fact, their marketing not only increased the number of consumers but also created a loyal customer base which makes cross-selling easier. People now believe that these brands understand their needs so well that they can blindly buy their products. Similarly, a company like Google which has technically advanced products can demand premium pricing as long as there is no other competitor. If not countered at the right time, demand pulls inflation can be very detrimental to the economy. Consider the example of Zimbabwe and Venezuela where inflation has transformed into hyperinflation leading to a catastrophic chain of events and eventually a civil war. Learning from these examples governments and central banks should try to address the root causes rather than taking a short cut route. They can increase interest rates, decrease government spending or increase taxes. Increasing interest rates in a phased manner are one of the best, time tested and simplest solutions as it not only decreases consumer expenditure but also incentivizes investments taking away extra money from the economy. Here a balance must be maintained as this will affect growth and that is why the central bank must take a holistic view of the economy before taking any decision.